Despite what you might expect, using oil on your face is actually a clever way to remove excess oil and dirt. Think of it this way — oil and water do not mix, but oil and oil do. Applying store brand olive oil (try to keep it on the lighter side, like virgin or extra virgin) with a cotton swab and then wiping off can help cleanse skin and remove dirt, sweat, and oil. Since there isn't a preservative to keep bacteria out of this, it's best to make small amounts and keep it in the fridge. Shake well before use to mix the glycerin and the water. Use within a week. Face: Brown sugar, colloidal oatmeal, or nut meals (like almond) are gentle enough for the sensitive skin of the face. Body: Sea salt with a coarser grain will help scrub down larger areas. Start with one part exfoliant and one part oil, then increase or decrease oil amounts depending on preference. Some people like completely dry scrubs, while other prefer oil-heavy scrubs, which have better spreadability. It's completely up to you! There are endless ingredients that can be used to make dry facial masks, but the most effective are charcoal and cocoa powder. It may sound bizarre, but using charcoal on the face is one of the best ways to remove dirt and toxins from under the surface of the epidermis. The easiest way to get ahold of ground charcoal is to buy a jar of charcoal pills, open the capsules, and add to the wet ingredient of your choosing (more on that later). Charcoal masks should be used for oily and acne-prone skin, as they may be too severe for dry or aging skin. For skin that needs more nourishing, using unsweetened cocoa powder delivers antioxidants directly to the face to help promote restoration and repair. The best part about making your own face masks is the ability to completely customize their formulas, by using any variety of wet ingredients. Oily skin should stick to citrus juices as they help to cleanse. Combination skin should use alternative milks that are on the thinner side, like almond. Dry skin does well with thicker ingredients like yogurts and alternative milks (like soy). And, of course, water can be used for a no-frills ingredient for all skin types. To make a face mask: Add the dry ingredient to a small bowl (like a sauce bowl or a shot glass), then add enough of a wet ingredient to form a thick paste. Apply to the face and let dry, then rinse well. Pat skin dry with a soft cloth and apply a moisturizer after. What are your favorite home beauty recipes? Aztec clay is an amazing blemish clearing mask! If you have oily skin, mix it with apple cider vinegar. If you have dry skin, mix with water and jojoba oil. It works so well and it's completely affordable. You can get a huge amount of the dry green powder for about $8. Only once have I tried the olive oil cleanse, which didn't take to my face too well. I do use witch hazel as a makeup removal. I can say that the DIY facial product that has been successful is my homemade facial scrub. I use honey, castor oil, ground cinnamon, and brown turbinado sugar (optional). It has worked wonders for my acne prone skin thus far! I have witnessed a more radiant and even skin tone. I do believe that DIY facial cleansers work way better than store bought cleansers. Manufactured cleansers can be quite hard on the skin whereas DIY cleansers really do get the job done naturally. This was a great article! Thanks for the information. 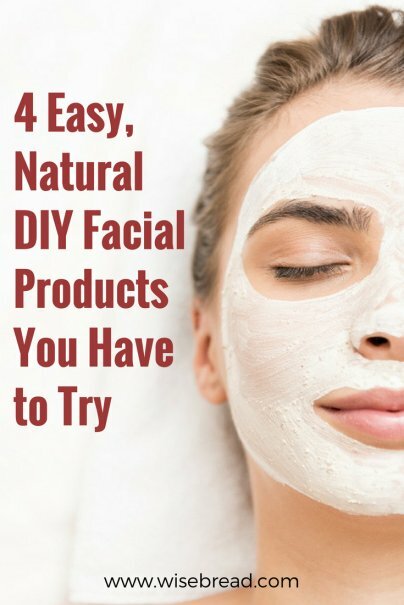 would any of these facial recipes be good to help get rid of the wrinkles under your eyes? and possibly the dark circles. I like all of them I am just looking for a good recipe that mentions the above because under my eyes are bothering me.